I met up with a foodie friend for lunch today who believes–as I do–in empowering others to cook. (Jen’s business is aptly named Catalyst Cooks.) I enjoy our visits because she doesn’t limit her ideas. Time with Jen is always inspiring. We ate at a popular Minneapolis cafe-style bakery, Sun Street Breads, and my gobbler sandwich (piled high with moist, tender, herb-flecked turkey) was yum. But I had a feeling the cookies I bagged to take home would be the real superstars. I was right. The Domino (Belgian chocolate cookies with white chocolate chips) was divine, though the big hit–for me–was the Crusher. The ingredient tag read chocolate chips, crushed pretzels, and broken up sugar cones. Combining chocolate and pretzels isn’t new, but the addition of the sugar cone struck me as brilliance. Why hadn’t I thought of it? I loved the idea, so went home to bake up a batch of cookies using chocolate chips, crushed sugar cones, and pretzels. A recipe for Monster Marshmallow Cookies listed several nuts, chips, and types of cereal, so seemed a good fit for this project as the pretzels and crushed cones could easily replace some of the stir-ins. I also liked the idea of using mini marshmallows. As usual, I played it fast-and-loose with measurements (for the stir-ins anyway) and ended up with more chocolate chips, marshmallow, etc then intended. More lacy than solid, the cookie’s structure–the word “craggy” comes to mind–had been stretched thin by the many stir-ins. Replacing half of the all-purpose flour with whole wheat flour also made for a slightly different chew. 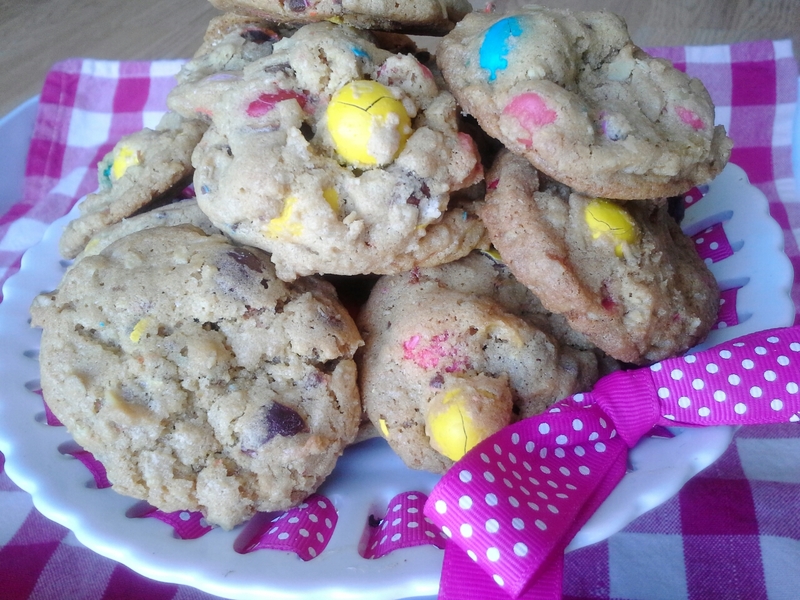 But in the end, the many ingredients–marshmallows, chocolate chips, m&ms, oats, pretzels, crushed cones–made for a crazy and crazy good cookie packed with contrasting textures and flavors. They weren’t Sun Street’s Crushers, but that had not been my intent. I had only wanted to make cookies that combined chocolate chips, pretzels, and sugar cones. I’ll stretch a bit here to say that my cookie find and subsequent baking project was a bit like my conversations with Jen. I’m encouraged to look at things from a completely different perspective, then inspired to work those new ideas into my own projects. My hope is that everyone has a friend like Jen as well as a pantry full of fun cookie ingredients for the next time inspiration strikes. Heat oven to 350°F. Line baking sheets with parchment paper or spray with cooking spray. In bowl, stir together flour, baking powder, and baking powder. 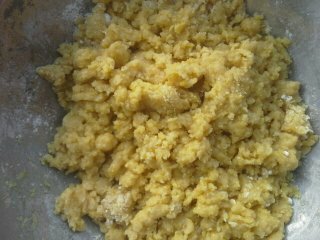 In separate bowl, beat together butter and sugars with electric mixer until light and fluffy. Beat in egg and vanilla. Stir in remaining ingredients. Drop dough by heaping tablespoonfuls onto baking sheets. Bake 10-12 minutes or until golden and set. Let cool slightly on baking sheets. Transfer to wire racks to cool completely. Makes 3 dozen cookies. A purchase of Lynne Rossetto Kasper’s Splendid Table (a.k.a. the Bible of all things culinary from the Emilia-Romagna region of Italy) had Mary thinking Italian this year, so we were treated to a lovely table draped with rich purples and reds. Tea-time treats included grape tomatoes stuffed with fresh mozzarella pearls and a small basil leaf, pears roasted with brown sugar and butter, and assorted small cookies and candies. 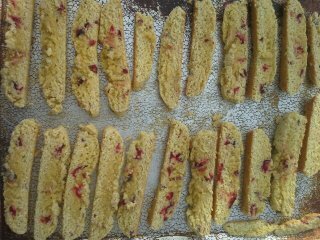 Having long collected biscotti recipes, I jumped at an excuse to bake up a batch to contribute to the tea party spread. 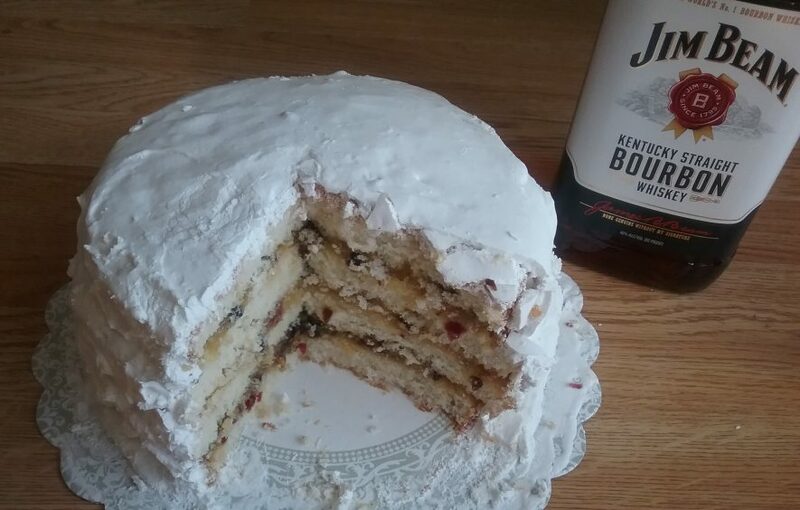 Torn between two recipes, I made them both. 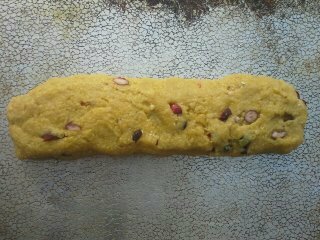 Polenta Biscotti looked authentic on the page as the dough was made of cornmeal and olive oil. 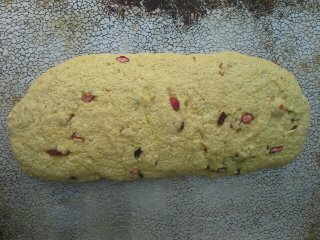 It looked terribly one-note in the mixing bowl, so I chopped up a cup of fresh cranberries to knead into the dough. The other biscotti recipe, Triple Chocolate, had been clipped from a Fitness magazine in the early ’90s and was fat-free except for an egg, pistachios, and chocolate. (Though doubling both the white and dark chocolate steered my version right out of that low-fat zone.) 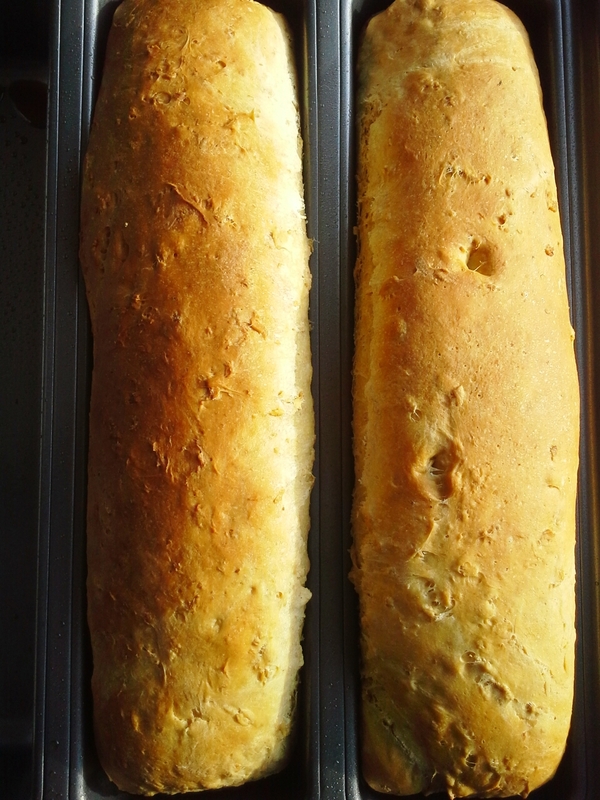 Both biscotti were tasty, though might have been a bit easier to chew had I not left them in the oven too long. Biscotti are meant to be dunked, though, so a quick soak in hot chocolate, coffee, and–yes–tea, make them very edible. 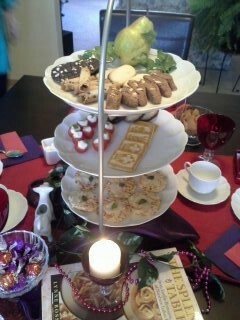 Mary and I enjoyed the biscotti more than did my girls, but they were too happy sipping sugar cube-laden tea to care. Thank you, Mary, for yet another amazing Tea Party. I stirred about a cup of coarsely chopped fresh cranberries into the dough before shaping. In large bowl, whisk together flour, sugar, cornmeal baking powder and salt. In separate bowl, whisk together eggs, oil and vanilla until frothy. Stir egg mixture into flour mixture to form soft dough. Turn dough out onto well-floured surface. Shape into 12-inch (or so) log; transfer to baking sheet. Bake dough 25 minutes or until almost firm when pressed on top. Remove from oven; cool on baking sheet 20 minutes. Reduce oven temperature to 300°F. Transfer cooled log to cutting board; slice diagonally into 1/2-inch-thick slices with serrated knife. Return slices to baking sheet; bake 10 minutes. Turn each slice over; bake 10 to 15 minutes longer or until lightly golden. Transfer to wire racks to cool. Makes about 2 dozen biscotti. In bowl, stir together flour, cocoa, baking powder and baking soda. In separate bowl, beat together egg, egg white, sugar and vanilla. Gradually beat flour mixture into egg mixture until blended. 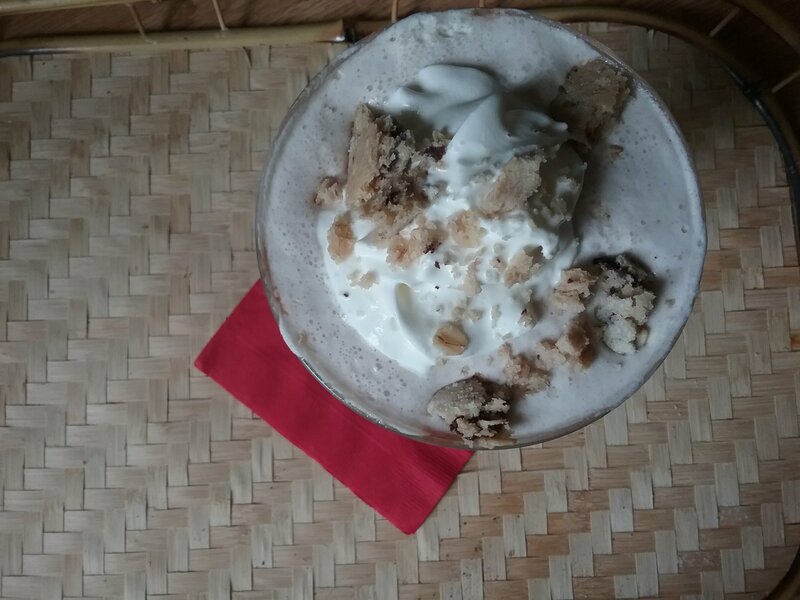 Stir in nuts and chocolate. 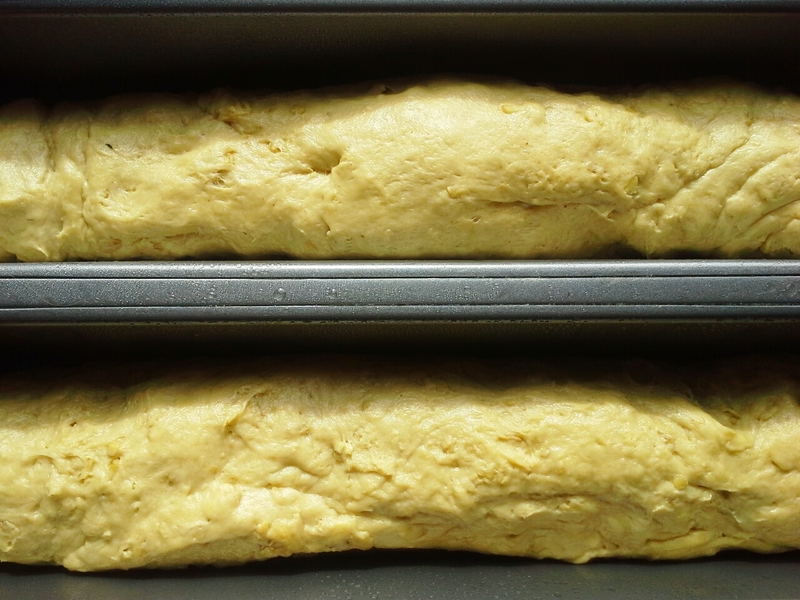 Gently shape dough into 12×2-inch log. Transfer to baking sheet. Bake 25 minutes or until almost firm when pressed on top. Remove from oven; cool on baking sheet 20 minutes. Transfer cooled log to cutting board; slice diagonally into 1/2-inch-thick slices with serrated knife. Return slices to baking sheet; bake 10 minutes. Turn each slice over; bake 10 to 15 minutes longer or until dough is firm. Transfer to wire racks to cool. Makes about 18 biscotti. Science fair time approaches, and my daughters are looking for project ideas. A few years back, the oldest thought it would be fun to do a kitchen science project; we baked up batch after batch of blueberry muffins, underbeating, overbeating, and all points in between. She shot photos and proved that overbeating muffin batter does indeed lead to those dreaded tunnels. With that success, baking drew her in again. She felt a strong pull toward chocolate chip cookies (that’s my girl:-)) so we decided to bake a batch with and without leavening. With a food science degree, as well as all manner of food-related resources at hand, you’d think I would know what leavening does in cookies. (I’ve worked for Betty Crocker, for goodness sake.) But I was clueless as to how cookies would bake up without baking soda or baking powder. I didn’t figure the 1/2 teaspoon was responsible for much actual leavening–cookies are puffy, but don’t rise as do muffins and other quick breads. Why is leavening important? Just for kicks, we also baked batches with butter and shortening (using the same recipe), knowing that the butter-containing cookies would spread and brown more than the ones with shortening. And the flavor would be far better with butter. Yet, the difference between the two batches was slight and not enough to give it Science Fair status. The batch sans baking soda, on the far right, is clearly paler and more cake-like. Flavor was flat and once cooled, the cookies had a tougher chew. 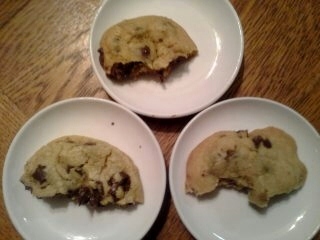 (Not saying we tossed them in the trash; they were still sweet, rich, and packed with chocolate chips.) But compared to the shortening and butter (best flavor by far–no surprise), they weren’t as tasty. Since it’s all about the science, I hit Shirley Corriher’s Bakewise to learn more about the exact role baking soda plays in cookies. Corriher confirmed my suspicion that “leavening in most cookies is minimal.” The alkali in baking soda promotes browning (seen in the paler unleavened cookies) as it neutralizes browning-inhibiting acids. Corriher’s book also noted that acidic baked goods (in this case, molasses-rich brown sugar contributed the acid) take longer to set, which was why these cookies baked through more slowly than the others. Flavor was a bit harder to pinpoint, but the cookies without leavening were off somehow. I’d imagine it was the acid-alkaline balance again: The acid in the brown sugar wasn’t balanced by an alkaline leavener, which had to affect flavor. 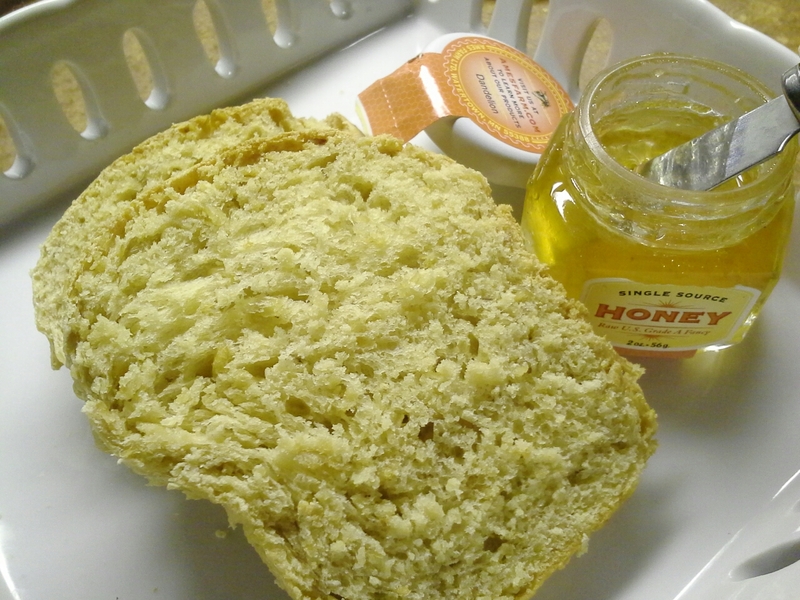 As for structure–less leavening (no matter how minor the role), less air, more dense, tougher chew. The project brought me back to my days in Food Chemistry. I love that so many disparate ingredients (flour, leavening, salt, etc) combine, interact, and reemerge as a cake, loaf of bread, batch of cookies. It seems magical, but it’s hard science and can be understood on a molecular level. 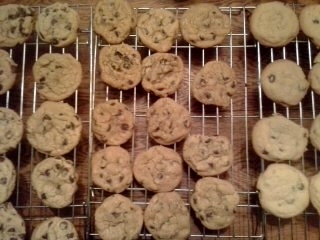 My daughter will bake more cookies for the science fair and delve into the details. But to most folks (myself included), the magic and allure of chocolate chip cookies will always trump science. Extra Virgin – Contemporary and cheeky culinary version of Green Acres. The Supersizers Go – British co-hosts “visit” different eras of history to reenact the life–and diet–of the time. Chuck’s Day Off – Chuck Hughes has my vote for best-looking and most charismatic on-air celebrity chef. Baron Ambrosia’s Culinary Adventures – Crazy food escapades that showcase small mom-and-pop restaurants around the country. Food Jammers – Three 20-something guys strip food production (frying, brewing beer, making ice cream, etc) down to its most basic. They visit hardware stores and the like to come up with wackadoo contraptions that somehow get the job done. Projects include a taco vending machine, cheese cave, and cityscape made entirely from chocolate. Eat Street – Likable smart-aleck host tours the country to scope out the food truck scene. There’s plenty more, and I realize many of these shows got their start on FN, but bringing them all together on Cooking Channel makes sense to me. When my husband mentioned he had heard that Eat Street was coming to the Minneapolis/St. Paul area to film, I was jump-for-joy happy. I could hunt the crew down and possibly watch the filming of a favorite TV show! A quick online search uncovered which food trucks the show would visit and when. Today was my best chance of making the location (Gastrotruck, Rice Park), so I met my husband for a lunchtime stroll through downtown St. Paul. We found Gastrotruck and saw filming taking place a block or so away from the actual truck. I had meanwhile spotted a new truck, Tiki Tim’s, that I’ve wanted to try, so ordered up their fantastic fish tacos. They were nicely garnished with chili-dusted crema and fresh cabbage, cilantro, and green onions. With lightly battered and freshly fried fish, these tacos were tasty, even more so just because they had been thrown together in the back of a truck. I dutifully snapped photos of my food, the truck, and menu board. We then wandered over to Potter’s Pasties & Pies where my husband got a beef pasty and I enjoyed an order of their much-lauded banoffee pie. Syrupy caramel, thin and lovely banana slices, rich and slightly sweet marshmallow cream–yum. Again, photos taken of truck and food. 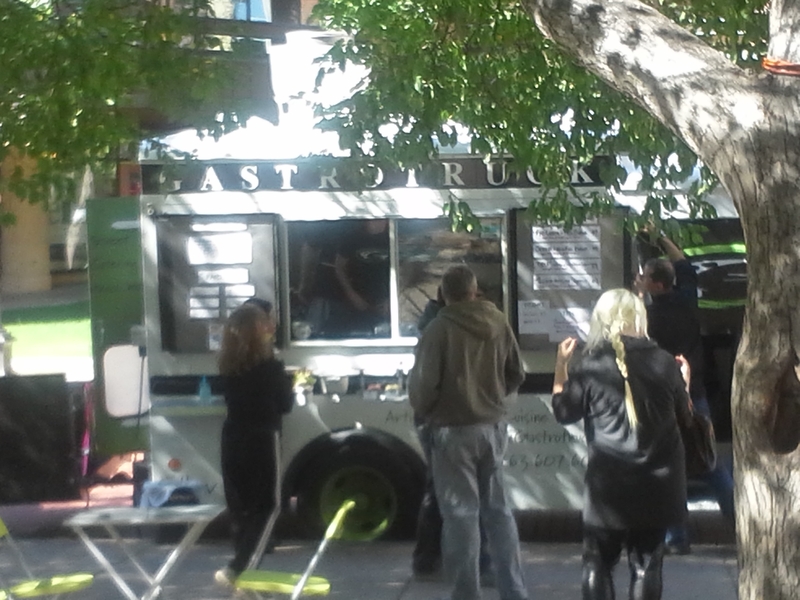 Last stop was circling back to Gastrotruck as the camera crew was finally filming the truck. I had hoped to catch sight of James Cunningham, Eat Street host, but no go. Clearly they keep the star talent at home. The peanut butter bread pudding I wanted to order was Sold Out (dang! ); instead, I tried the quinoa salad. (Didn’t want another full entree, though would have managed to find room for that second dessert.) A crew member approached and we chatted, but because I hadn’t ordered one of four menu items they were featuring, I wouldn’t make the filming cut. If that wasn’t enough of a downer, remember my photos? Stunning fish tacos? Crazy good banoffee pie? Quirky food trucks and their menu boards? When I got around to posting my pix, I could find only the Gastrotruck picture and a message that my SD card had “failed and erased.” Arrrgh. I don’t have photos, I didn’t meet JC, and I wasn’t interviewed on a national television show. Them’s the breaks. On the up side, I got a long walk in on a gorgeous day (with my husband, which means I get bonus “date afternoon” points) and enjoyed seeing and even eating from multiple food trucks. In the end, I’ll still call it a good food day. When my oldest came home from school with the recipe for these cookie pops (her class had watched the video as part of their puppet unit), I knew we had a project for the evening. Admittedly, I’m not especially good at decorative baking; my style is a bit too casual to make things look “just so.” That said, this seemed a fun project. We had everything we needed save circus peanuts and fruit leather. A quick trip to the grocery store solved the circus peanut shortage and we decided to flatten red Starburst® candies instead of buy fruit leather. After a quick supper of scrambled eggs, toast, and strawberries (had to be healthy if the cookie pops were coming), we frosted and sprinkled our way to six Swedish chef pops. They were a bit putzy (and messy), but fun to make. And while they won’t win any nutrition awards, each pop has fewer calories than a candy bar or large cookie. There are worse foods you can serve to kids. If you like the Muppets, sweets, and playing with your food, I say give it a go. Adapted slightly from http://www.dashrecipes.com/recipes/dr/s/swedish-chef-pops.html Follow the link for more detail on assembly. For each pop, spread a bit of peanut butter on flat side of each cookie. 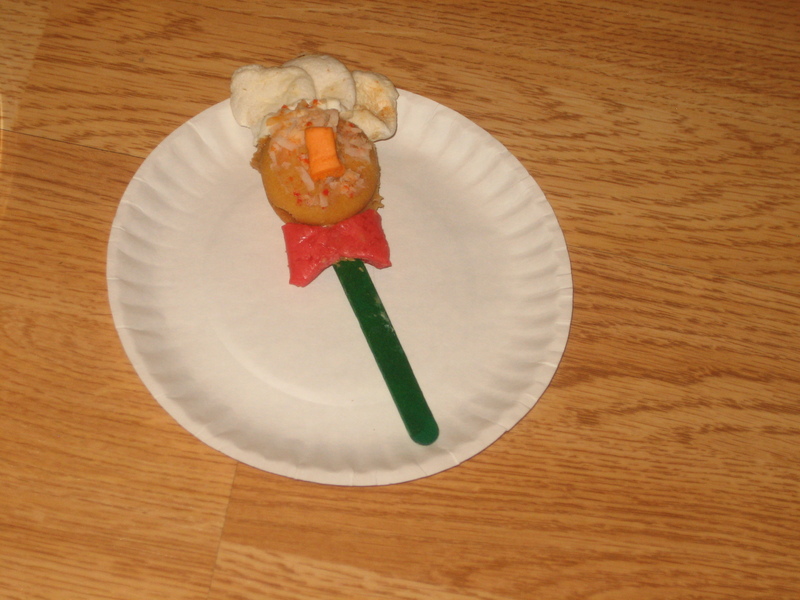 Press flat sides of cookies together, inserting craft stick between cookies to form “pop.” Create bushy “eyebrows” and “mustache” on one side of cookie pop using peanut butter as “glue.” Cut small piece from circus peanut and attach as “nose.” Cut large marshmallow into 3 circles and press pieces together, fanning slightly, to form chef’s hat. Attach to pop with cream cheese. Twist fruit leather to form bow; attach to craft stick just below cookie for bow-tie.